The global subsea systems market is estimated to be USD 15.78 Billion in 2016, and is expected to grow at a CAGR of 2.02% from 2016 to 2021. Increasing deepwater production and exploration activities and investments by emerging economies in offshore exploration are major factors driving the subsea systems market. This research study involved the use of extensive secondary sources, directories, and databases such as Hoovers, Bloomberg Businessweek, Factiva, and OneSource to identify and collect information useful for a technical, market-oriented, and commercial study of the global subsea systems market. Primary sources are mainly industry experts from core and related industries, preferred suppliers, manufacturers, distributors, service providers, technology developers, standard and certification organizations of companies, and organizations related to all the segments of this industry’s value chain. The points given below explain the research methodology. The ecosystem of the subsea systems market consists of Original Equipment Manufacturers (OEMs), service providers, and oilfield operators. The figure given below shows the market ecosystem along with major companies. The global subsea systems market is projected to grow at a CAGR of 2.02% from 2016 to 2021, to reach a market size of USD 17.44 Billion by 2021. This growth is attributed to increasing focus on oil & gas production from offshore fields, particularly activities in deepwater reserves. The report segments the subsea systems market on the basis of type into subsea production system and subsea processing system. The subsea production system segment is projected to dominate the subsea systems market throughout the forecast period. The subsea production systems market is segmented based on components into SURF, subsea trees, control systems, and manifolds. The SURF subsegment accounted for the largest market share in 2015, driven by deepwater drilling and production demand. 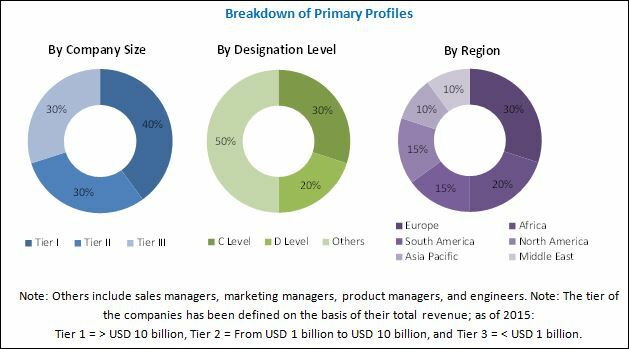 The report segments the subsea processing system market based on technology into subsea boosting, subsea separation, subsea water injection, and subsea gas compression. Subsea processing system reduces dependence on costly topside facilities for offshore operations and is gaining importance as companies look to cut costs in a low oil price scenario. Boosting technology dominates the subsea processing system market owing to the growing usage of large application for improving recoveries from aging fields and enhancing production. Subsea gas compression technology is in the development stage when compared with the other technologies. Majority of the subsea compression system projects are in pipeline in the North Sea. 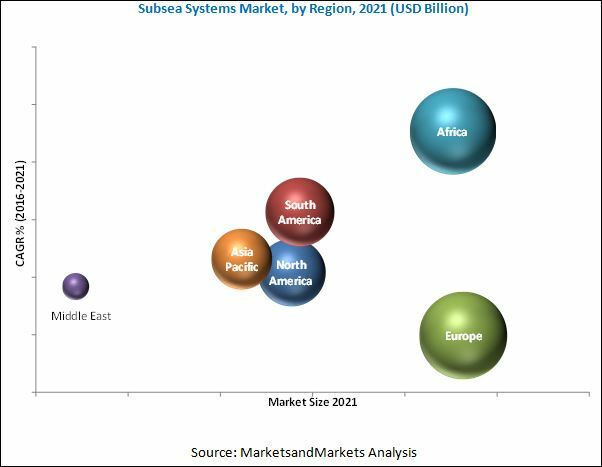 In this report, the subsea systems market has been analyzed with respect to five regions, namely, North America, Europe, Asia-Pacific, the Middle East, South America, and Africa. The European region led the subsea systems market with the largest market share in 2015, and the trend is projected to continue till 2021. This growth can be attributed to the subsea production activities in offshore Norway and the U.K. Major reforms have been done by both the governments for increasing oil production which would provide significant growth of the subsea systems market. Africa is the fastest growing market in the subsea production system during the forecast period. The growth is due to the rising investments in major oil producing African nations, namely, Angola, Ghana, Nigeria, and Equatorial Guinea, driven by large new offshore discoveries. The low price of crude oil in the international market is a restraint for the subsea systems market. The continuing downturn in oil prices has resulted in large-scale cut backs in exploration and production spending by major oil companies around the world. Costly offshore projects are being given a second thought keeping in mind the prevailing scenario. However, long-term projects are expected to remain on track with expectations of price recoveries in the closing years of the decade. Leading players in the industry, based on their recent developments and other strategic industrial activities, include Subsea 7 (U.K.), FMC Technologies (U.S.), GE Oil & Gas (U.S.), Aker Solutions (Norway), One Subsea (U.S.), and Technip (France). In terms of growth strategies, market players have been focusing on winning large number of contracts & agreements to increase their market size and strengthen their market foothold in the regional market. New product launches are the second most commonly adopted strategy of the key market players in the industry. This shows a mix of both organic and inorganic growth strategies. The impending merger of FMC Technologies (U.S.) and Tehcnip (France) will alter the competitive dynamics of the market by creating a potentially market leading entity in the subsea industry.